According to a recent study by Transparency Market Research (TMR), the global prepacked chromatography columns market has an extremely consolidated vendor landscape, with only two companies accounting for a lion’s share in the overall market. These companies are Repligen and GE Healthcare and as per TMR, they accounted for over 78% of the global market in 2015. Smaller players in the global prepacked chromatography columns market on the other hand are focusing on customizing products to gain traction. Furthermore, these companies offer products at a competitive pricing, which is gradually expected to catapult them to the market’s fore. According to TMR, strategic alliances are popular among the smaller companies, especially those aiming to expand their regional footprint and consolidate market share showcasing a wide-ranging product portfolio. 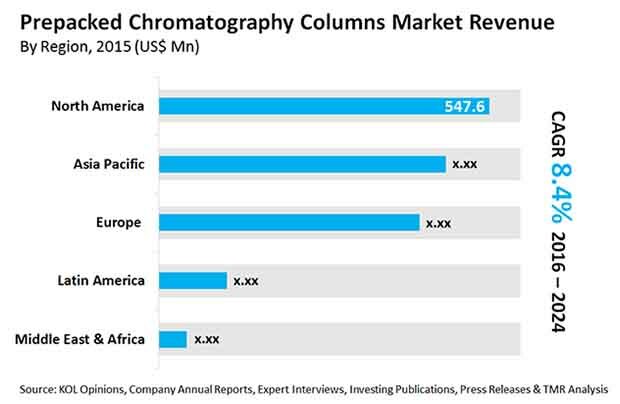 TMR projects the global prepacked chromatography columns market to reach US$3.3 bn by 2024 from US$1.6 bn in 2015. If these figures hold true, the global market will rise at a CAGR of 8.4% between 2016 and 2024. Regionally, North America will continue dominating the global prepacked chromatography columns market through the course of the forecast period. However, in the coming years, the market in Asia Pacific is likely to exhibit growth at an accelerated pace. In terms of end use, the pharmaceutical biotechnology segment is currently showcasing high demand for pre-packed chromatography columns. Besides this, the demand from analytical laboratories is forecast to rise in the coming years. The suitability and versatility of pre-packed chromatography columns across diverse sectors, allowing them to identify and separate organic components and molecules, is the chief driver of the market. Furthermore, the market will considerably gain from the increasing use of pre-packed chromatographic columns in research and development activities, forensic lab, chemical research, biotechnology, agriculture, food and beverages, and biopharmaceutical research. Diverse applications area of these columns will therefore boost the global pre-packed chromatographic columns market over the course of the forecast period. In addition to this the rising of pre-packed chromatography columns in clinical trials will boost the market in the coming years. On the downside, the market might face certain troubles due to the high price of pre-packed chromatographic columns. This, as per TMR, can slow down the pace of growth witnessed in the market to an extent. Furthermore, restraints the market witnesses as a result of fouling and plugging will also have a negative impact on the overall growth.